Find out how to make octodog the complete method and step by step . 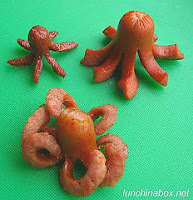 Octodog is a mini-sausage shaped like an octopus. 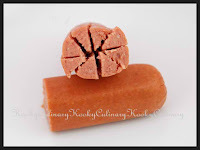 Sausage Types: First, I looked at some commonly available sausages. From the left, there’s a mini cocktail sausage (Smoked Beef cocktail sausages from Costco), half of a regular American hot dog (Ball Park Franks), and a Japanese Kurobuta arabiki pork sausage (JFC brand) that I picked up at a local Japanese market. 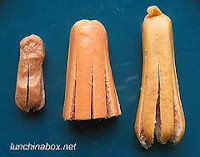 You can see that they’re different sizes, but a not-so-obvious difference is that the arabiki sausage uses a natural sausage casing that helps the octodog legs curl when cooked (and gives it a crunch when you bite into it). 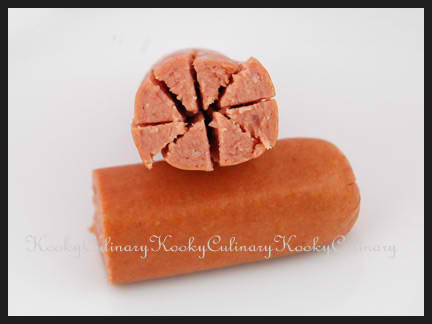 Cutting : First, cut the hot dog into half. You can actually use the entire hot dog if you want really long tentacles. I’ve even done a 3/4 and 1/4 size for a mommy and baby octodog. Using a sharp knife, make a slit in the middle and down till almost 3/4 way down to create the “legs” of the octopus. Then make a few more additional slits till you get 8 legs. Sometimes I use a scissors to make those slits especially when I am making a baby octodog. The knife can get a little slippery, so I find it easier just to snip with a scissors. 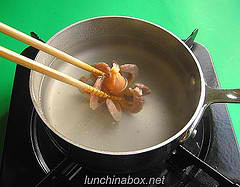 Cooking: Dump the hotdog into a pot of boiling water. As it sits in the boiling water, the tentacles will start curling up. There’s another method: you can fried the sausage in a shallow pan with a half cup of water to help the legs curl. The deeper water conducts heat more thoroughly throughout the sausage, which is key for hot dogs that need a little extra help. Simply pan-frying the hot dogs without water doesn’t seem to apply even enough heat to help the legs curl nicely. Decoration: For the eyes & mouth of your octodogs, stick black sesame seeds or onion seeds onto the head with a little honey, or use cream cheese or another sticky spread to affix little round cutouts of sliced cheese and nori to make eyes and mouths. And you’ll have the Octodog!!! Have fun making these!! Uncover the Secret Recipes from Your Favorite Restaurants!Easily Prepare the Most Guarded Restaurant Recipes in Your Own Kitchen.The same tastes and flavors for a fraction of the cost!